We Know The Best Fishing Guides In The Business. 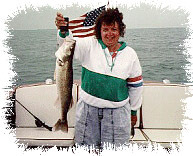 We Book Charters With Over 150 Charter Captains. We Can Book The Date You Want! 8 Hours or Limit Approximately $400.00 to $480.00 for a Party of 6 people depending on the Captain. We can also arrange reservations on Headboats for $25-$35 per person per day. Since you are there and we are here, we can arrange anything you need in this area. 7012 State Route 163 E.